FILE - Visitors look at a display of information technologies at an exhibition highlighting China's achievements under President Xi Jinping's leadership, at the Beijing Exhibition Hall in Beijing, China, Oct. 17, 2017. 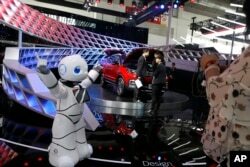 FILE - A robot entertains visitors at the booth of a Chinese automaker during the China Auto 2018 show in Beijing, China, April 26, 2018. Under President Xi Jinping, a plan known as "Made in China 2025" aims to make the country a tech superpower. The move by officials to downplay and stop mentioning the plan and other recent measures to open up China's economy are positive signals, said Scott Kennedy, deputy director of the Freeman Chair in China Studies at the Center for Strategic & International Studies in Washington. 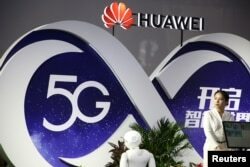 FILE - A woman stands at the booth of Huawei featuring 5G technology at the PT Expo in Beijing, China, Sept. 28, 2018. “Regardless of any re-branding exercises and concessions made by the Chinese government to appease Western minds, efficient policy implementation in industries and technologies listed under the Made in China 2025 scheme remains a top priority,” Holzman at Merics said.